One face of globalization is the never-ending search by business for markets and profit in every corner of the world. There's another face to globalization. It includes volunteers willingly donating their money and time to help people in other countries. For 21 years, a Minnesota-based nonprofit group called Global Volunteers has been sending thousands of people around the world on what amount to working vacations. St. Paul, Minn. — The English language, it turns out, is one of this country's most popular exports, and people in China are among the most enthusiastic customers. That's what Norma Halbur found out almost immediately upon arriving in China's Shaan Xi province. People with cameras crowded around Halbur and the other American volunteers and urged their children forward to speak English and have their picture taken with the visitors. "Every place we went, it was like being the status of rock stars," she says. Halbur, a retired teacher from Shoreview, and her 14-year-old grandson Derek were on a working vacation through Global Volunteers. 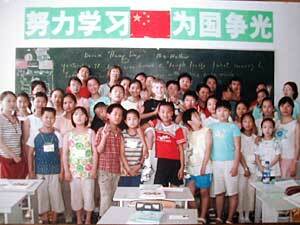 They paid for the opportunity to spend two weeks teaching conversational English to 35 middle school students in a Chinese village. "They loved, 'row, row, row your boat,' she said. "We sang little songs, we did limericks, we did anything that would help them converse in English," Halbur says. Halbur says farm families lined up to enroll their children in the four-hour-a-day, five-day-a-week summer courses taught by the Americans. "It was more more work than what I anticipated when I went," she says. Global Volunteers sends people to work sites in 18 overseas locations and in seven states in this country including three work sites in Minnesota. Global Volunteers co-founder Michele Gran says one of their most ambitious projects is construction of a new school in a remote Chinese farming village. Chinese leaders are using the project for their own purposes to illustrate the country's state of the art education infrastructure. However the main beneficiaries are the hundreds of students who would otherwise not have access to a high quality education. The impact of the person-to-person style of globalization came clear when Global Volunteers marked a milestone. A year ago the organization sent it's 100th team of volunteers to China's Shaanxi province where Gran says they were given a welcome like those accorded to heads of state. "They gave us precisely the same welcome at the city wall, the city gate in Xi'an that they gave President Clinton three years earlier," she says. Minnesota-based Global Volunteers is one of many groups specializing in a humanitarian form of globalization. The work is often in sharp contrast to the bottom line mercantilism of multinationals, or to the proselytizing of religious groups or to the often controversial foreign policy of the U.S. Government. Few Minnesotan's have observed the effects of globalization more closely than Bob Hoyle. Hoyle retires this month as the executive director of the St. Paul-based International Institute, a non-profit specializing in fostering international understanding. Hoyle has worked overseas as a former refugee resettlement supervisor for the United Nations and as a Peace Corp volunteer in the Philippines in l961. He says person-to-person style of globalization reveals how the aspirations of people in other countries are affecting the lives of Americans. "These people want to share in the world's resources and they want us all to prosper together, and if America doesn't lead in this it's going to be the sadder for it," he says. Norma Halbur has few illusions about the impact she and her grandson made during their two week stint as volunteers in rural China. However she says they made a contribution. Her grandson keeps up contact with a handful of friends he made. "He's getting emails from them, he's gotten a phone several times, he made some good friends," she says. It was a person-to-person contact and friendship 21 years ago by a man from China's Shaanxi province visiting Minnesota that created the pipeline for the Global Volunteers team members who've gone to that country and who have made a lasting impression on a generation of people.